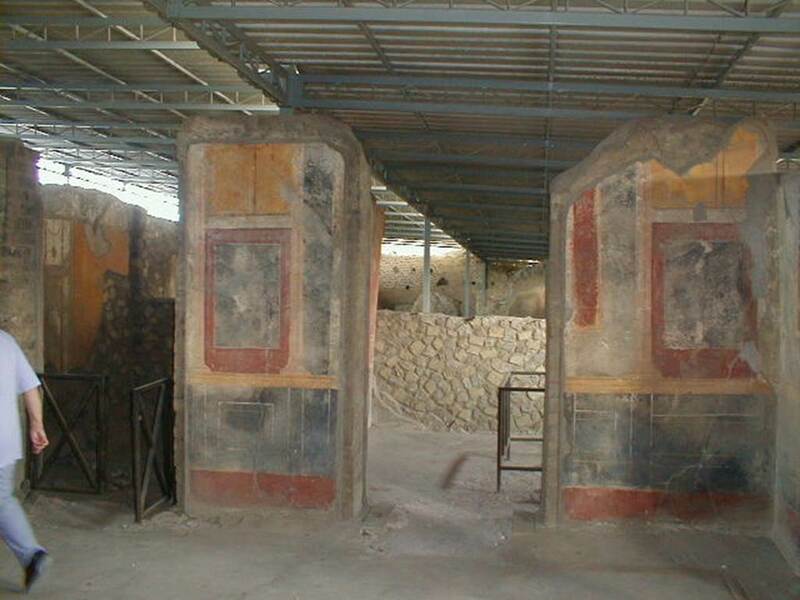 VI.17.42 Pompeii. May 2010. Steps to entrance. VI.17.42 Pompeii. May 2010. 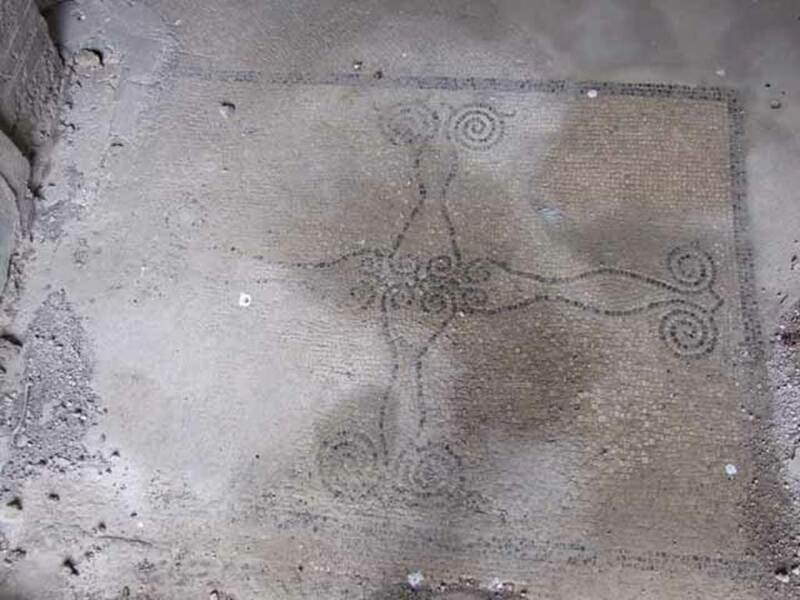 Mosaic in the form of a cross at entrance, vestibule 1. 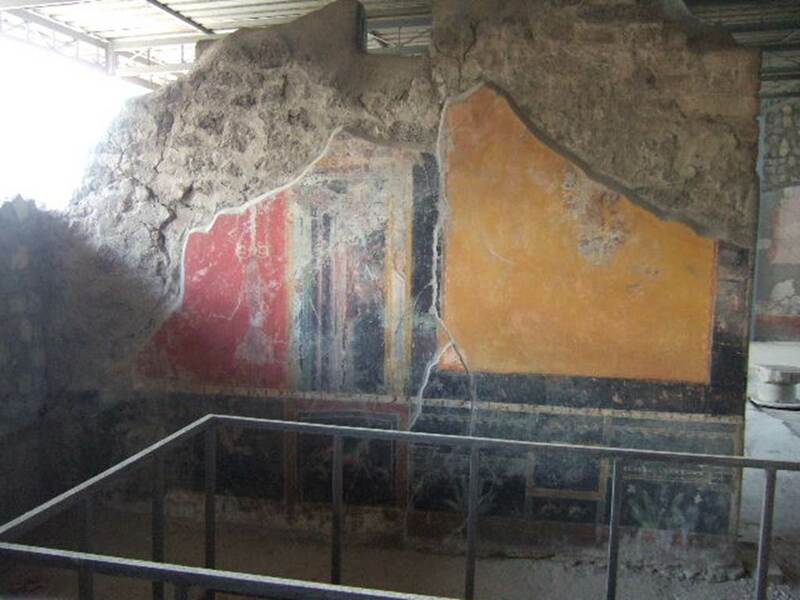 VI.17.42 Pompeii. May 2010. Painted wall plaster on south side of entrance vestibule 1. VI.17.42 Pompeii. May 2010. Small room 5 on north side of entrance vestibule. 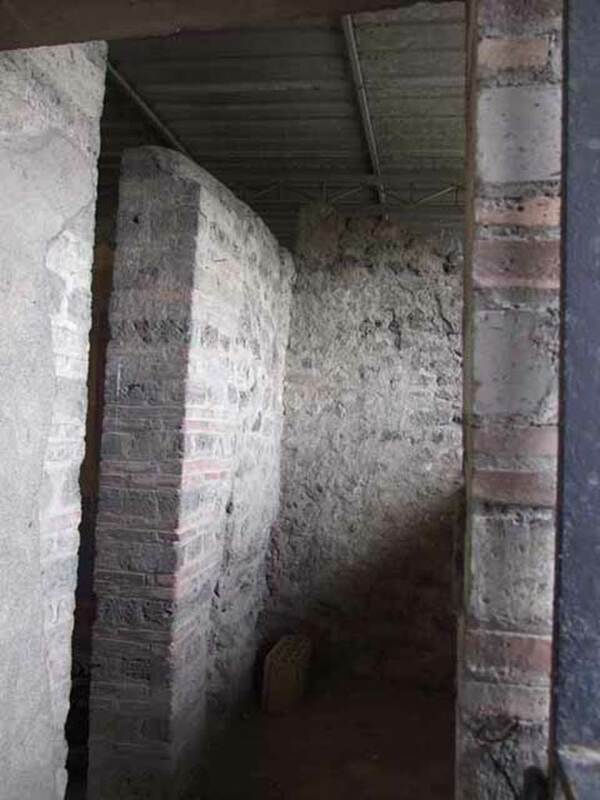 VI.17.42 Pompeii. September 2004. North-west corner of atrium 4, on upper level. 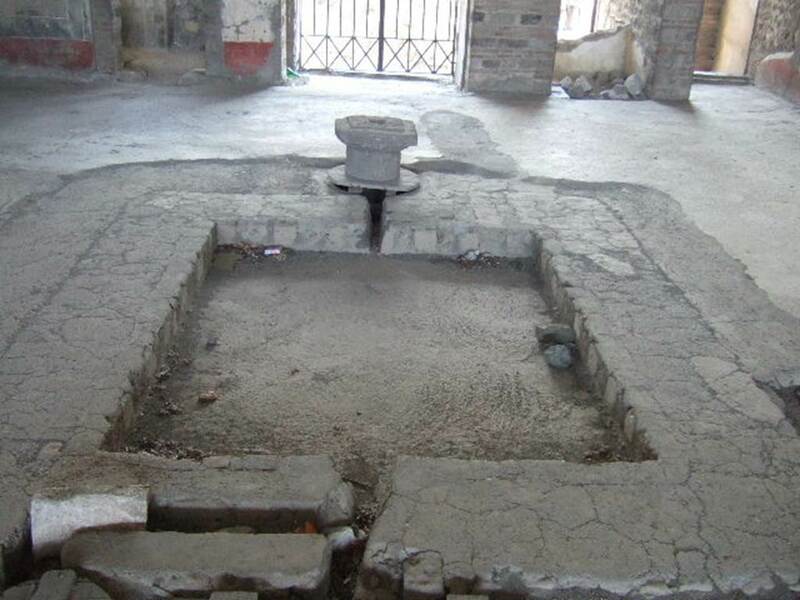 VI.17.42 Pompeii. May 2006. Impluvium in atrium 4. Looking east towards entrance. 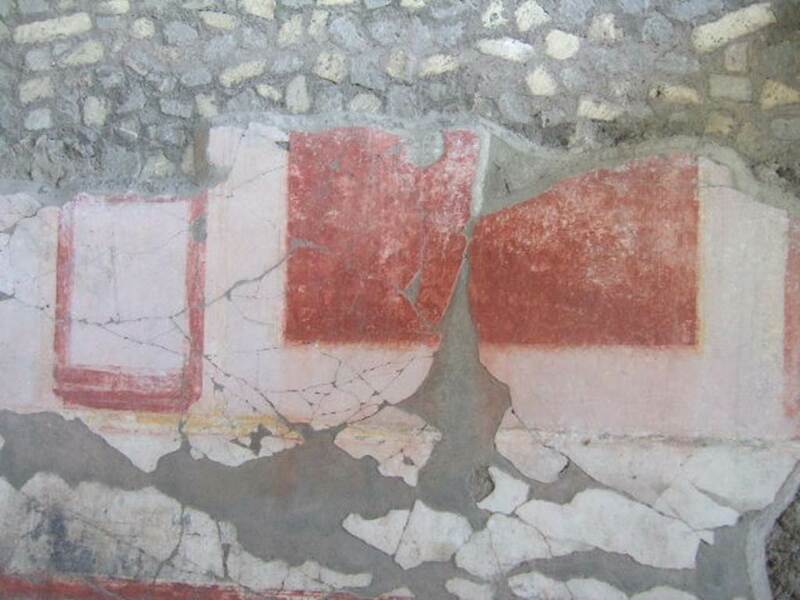 VI.17.42 Pompeii. May 2010. Looking south across atrium 4 from entrance. 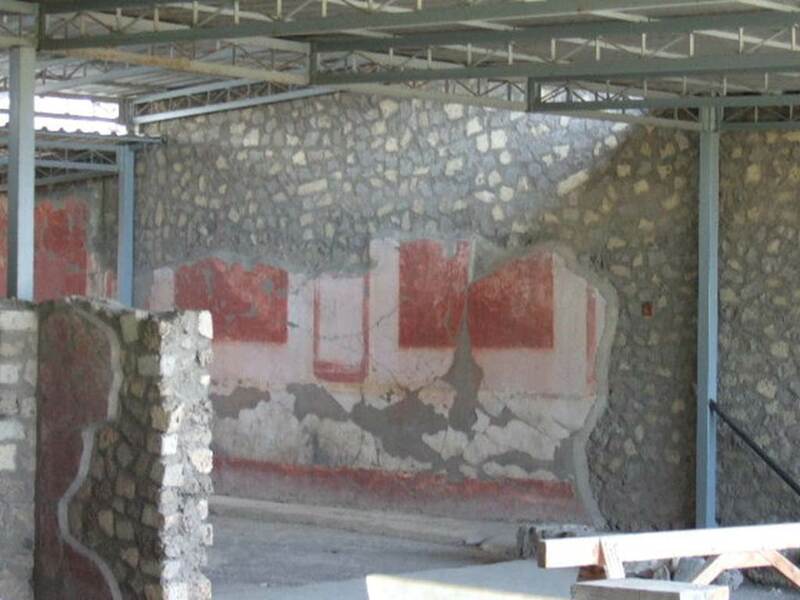 VI.17.42 Pompeii. September 2004. 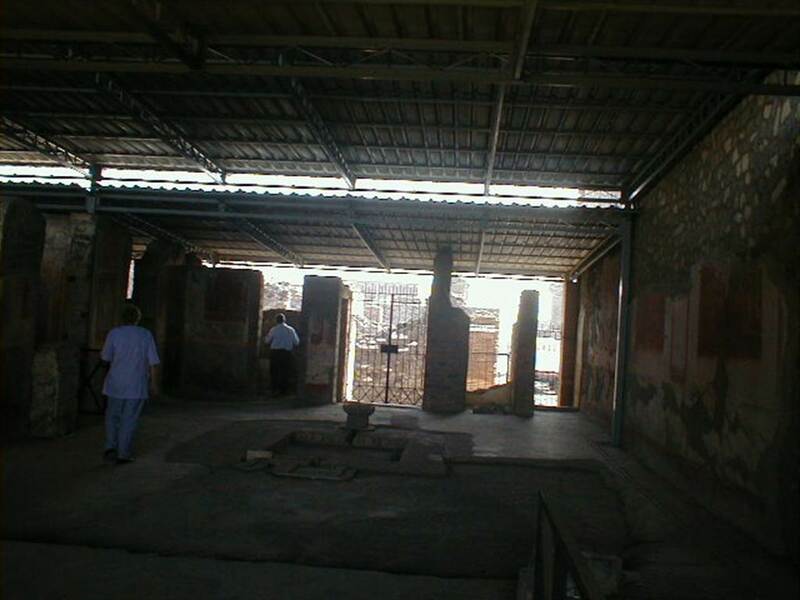 Looking east across atrium 4 to doorways of room 5 and entrances VI.17.42, VI.17.43 and VI.17.44. 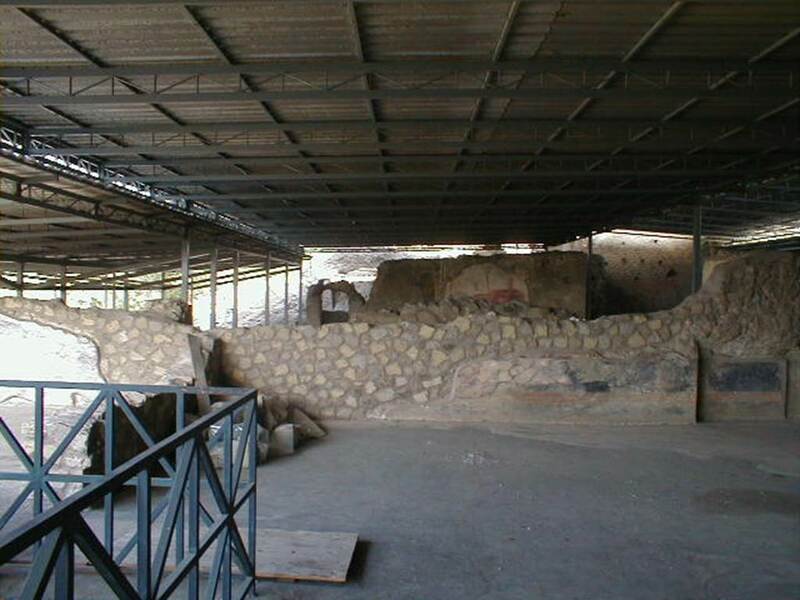 VI.17.42 Pompeii. September 2004. North side of atrium 4. VI.17.42 Pompeii. May 2015. 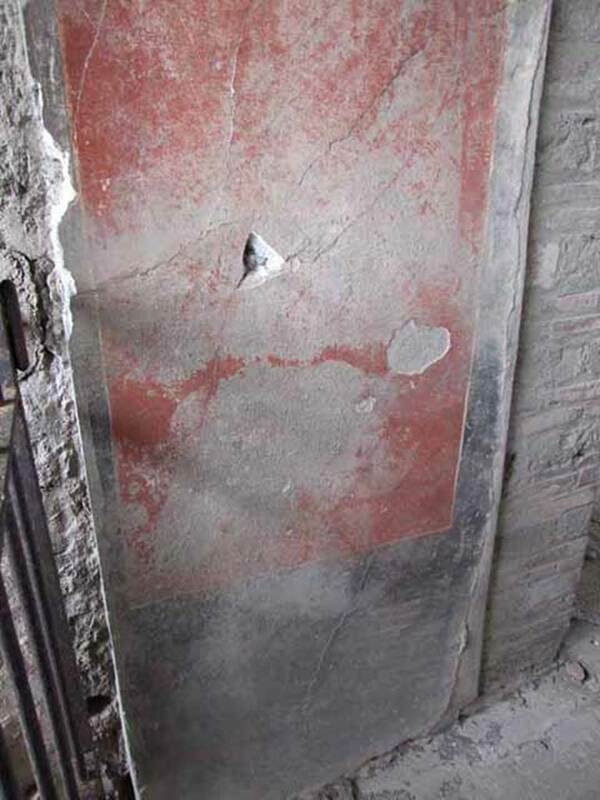 Painted panel on north side of atrium 4, between cubiculum 7 and triclinium 6. VI.17.42 Pompeii. September 2004. 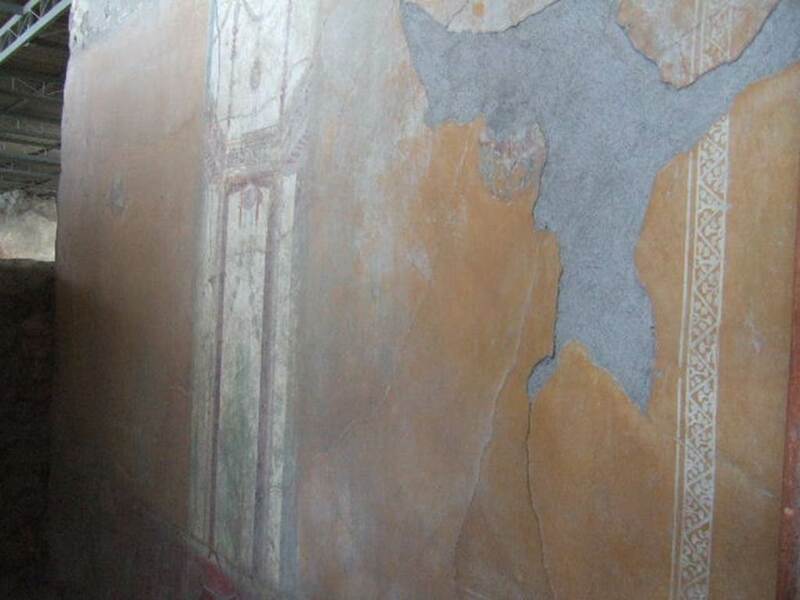 Painted plaster on north side of atrium 4, west of triclinium 6. 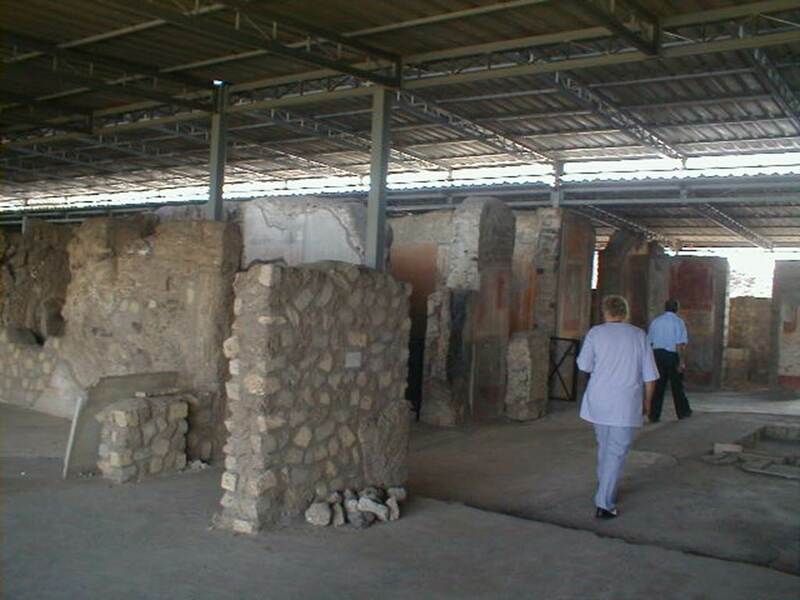 VI.17.42 Pompeii. September 2004. 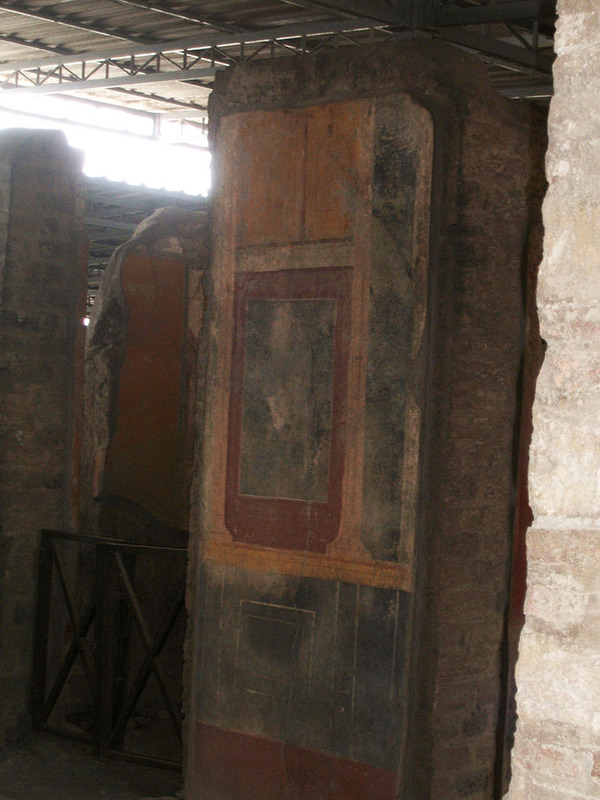 Doorway to triclinium 6, a room on north side of atrium. VI.17.42 Pompeii. May 2006. 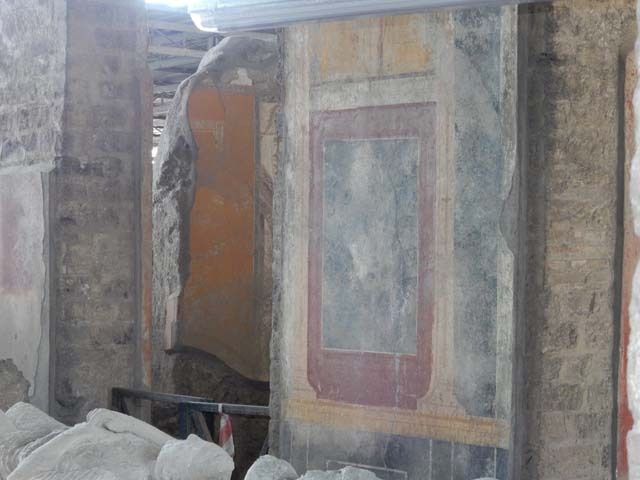 Looking in to triclinium 6, west wall. 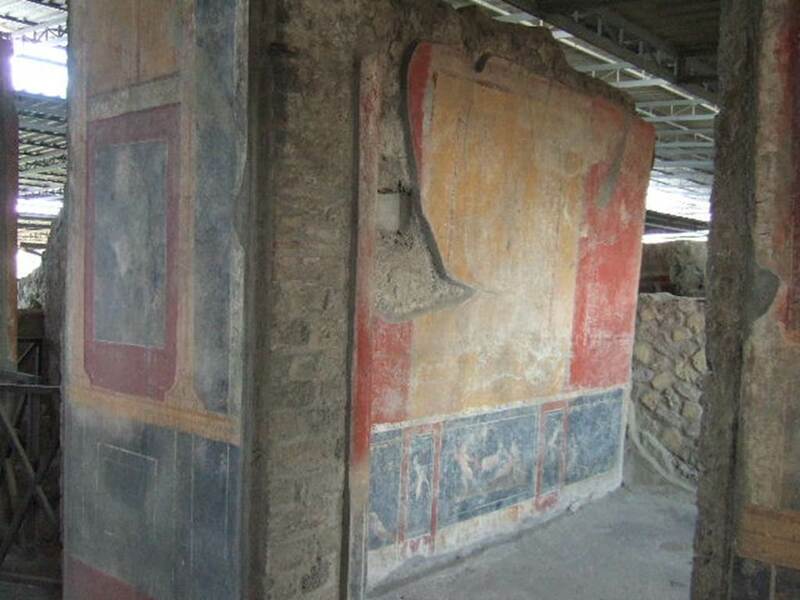 VI.17.42 Pompeii. May 2006. Triclinium 6 west wall, with floating figures, cupid hunting, plant and bird. 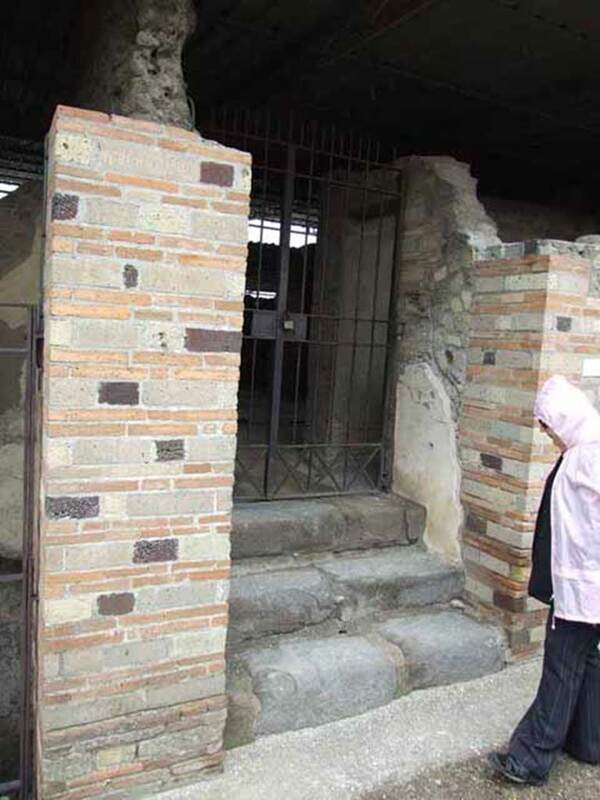 VI.17.42 Pompeii. May 2006. 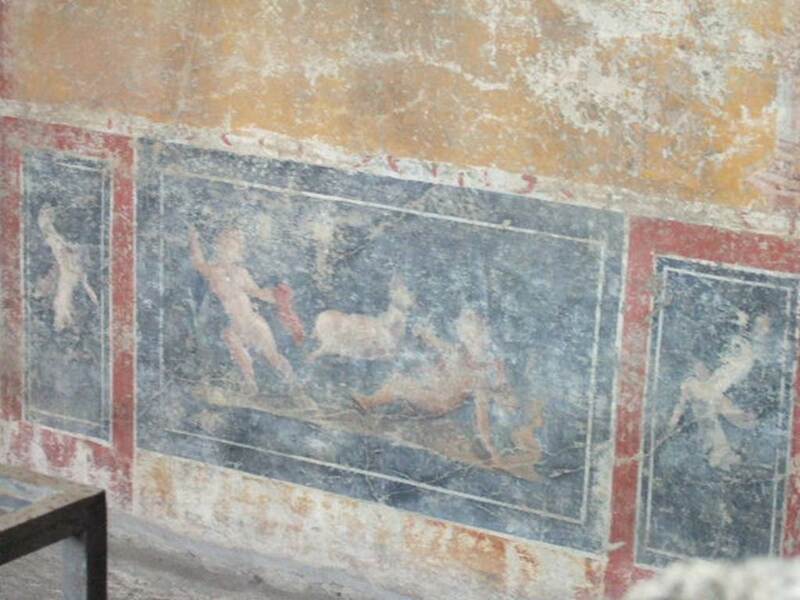 Triclinium 6, west wall with detail of a cupid hunting. The cupid on the left has a lance and a red mantle and is pursuing a deer that is moving to the right. 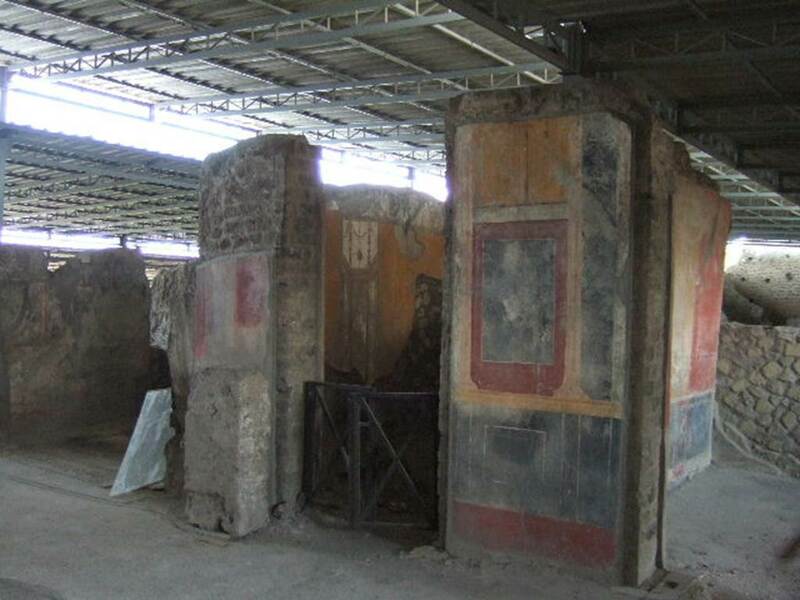 VI.17.42 Pompeii. May 2010. 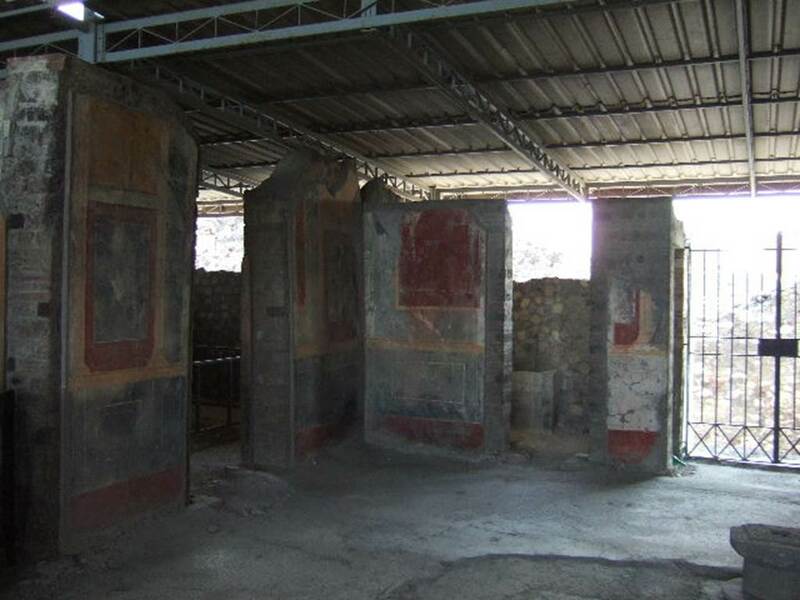 Looking into triclinium 6 from room 5. 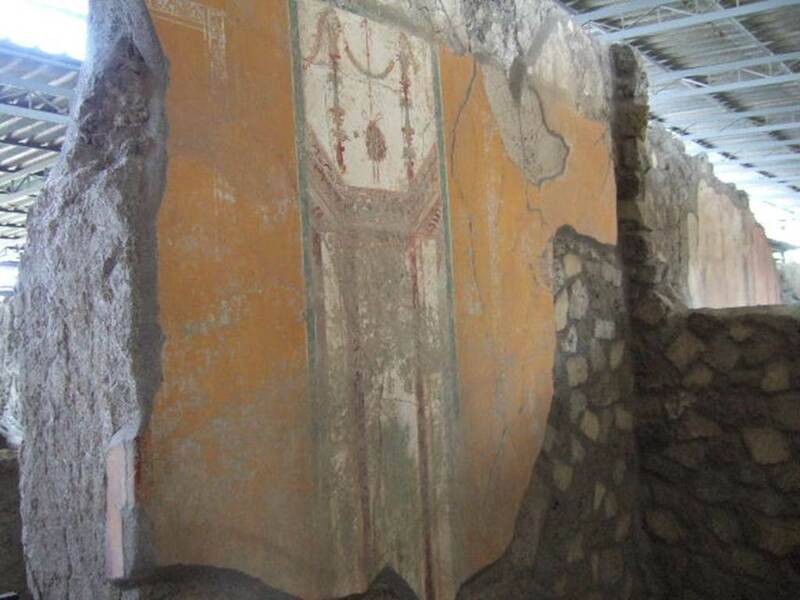 VI.17.42 Pompeii. May 2006. 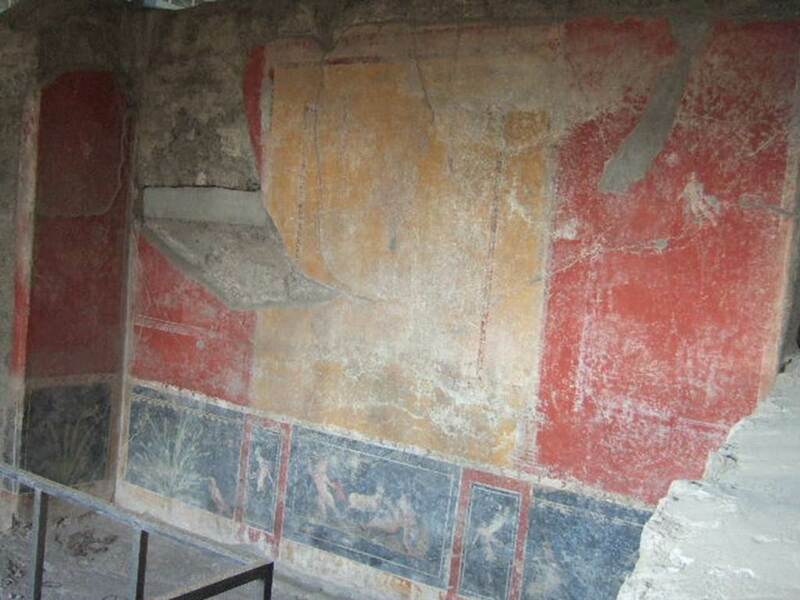 Triclinium 6, south wall. Painted wall with birds and plants. VI.17.42 Pompeii. May 2006. Doorway to cubiculum 7 on north side of atrium. 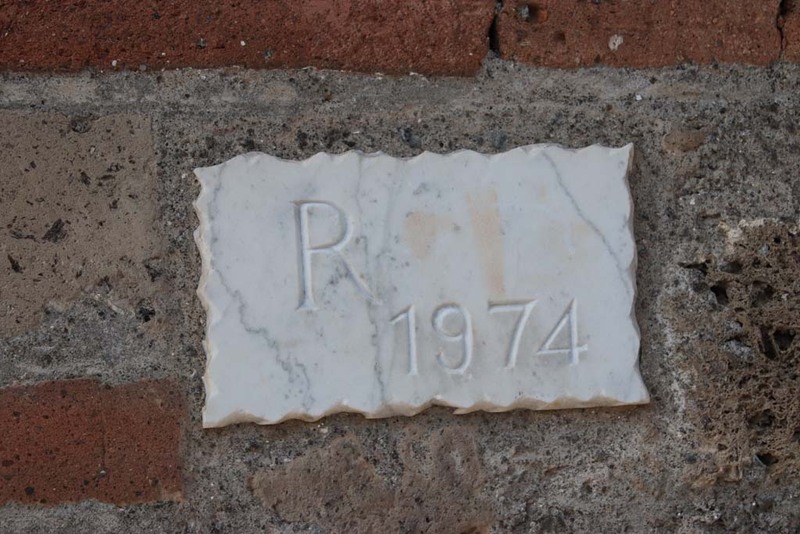 VI.17.42 Pompeii. May 2006. Cubiculum 7, east wall with architectural panel. VI.17.42 Pompeii. May 2006. 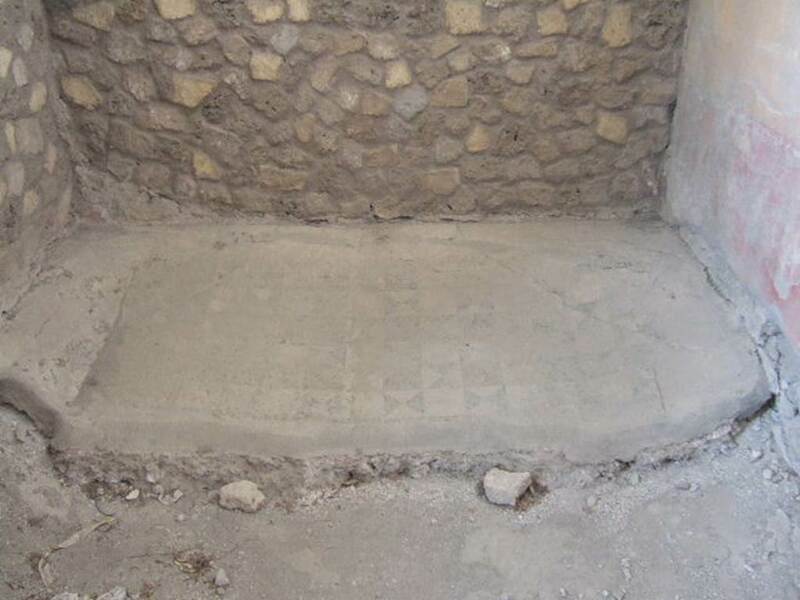 Cubiculum 7, mosaic floor in alcove. VI.17.42 Pompeii. May 2006. Cubiculum 7, architectural panel on east wall. VI.17.42 Pompeii. May 2006. Rooms 6 and 5 in north-east corner of atrium. VI.17.42 Pompeii. May 2006. 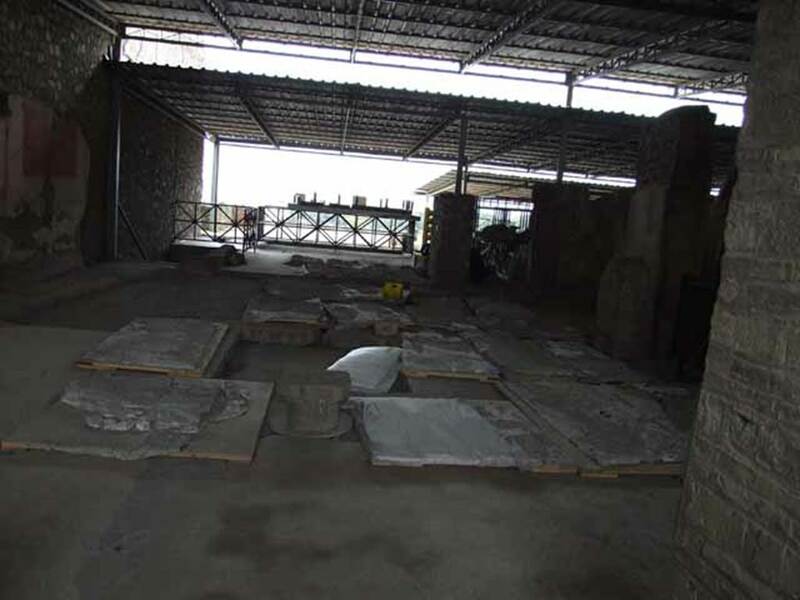 South wall of atrium 4. 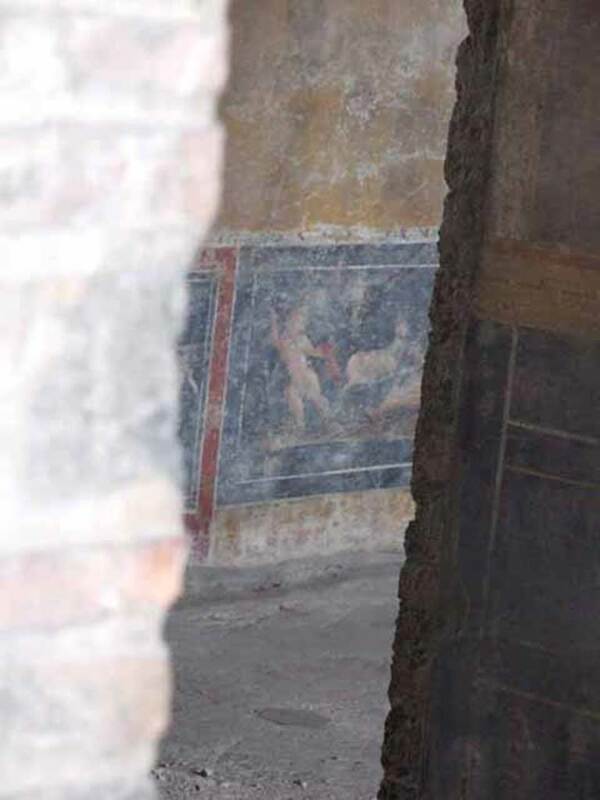 VI.17.42 Pompeii. May 2006. West end of south wall of atrium 4.